Buying a property that’s in less than good condition can be an excellent way to save a lot of money. But to make the purchase worth it, you need to be on the ball with your repairs to stick to a budget. When the sale is first finalized, and you walk into the house, you might feel a bit overwhelmed. There’s a lot to do, and it’s tough to decide where you should start. But there are some things that you should tackle before others so you can get started on the smaller details. Begin your project by taking care of these areas first to give you some peace of mind and a better idea of your costs. Before you move inside to paint or install new floors, you need to look at the outside of the property. Checking the exterior of the house for anything that needs touching up should be your first job. When you do this, it’s not just about how it looks, but the general condition of the property too. If there’s damage to the roof, cracks in the walls or leaks around doors and windows, it could be bad news. Getting these problems sorted as soon as possible is essential. First, look toward roof repair to ensure that the house is protected from the elements. Survey the walls too, to see if there are cracks or perhaps grouting that need addressing. You might also need to reseal around windows and doors. Once you’ve moved inside, you might want to address the floors first. They might not need any work, but changing them can immediately lift the room into something new. If there are carpets, you might consider stripping them out. Some people choose to restore the hardwood floors underneath, but you might want to replace the carpets too. However, you could go with something different altogether. You might want a more practical floor for a kitchen, for example, or tiles in your bathroom. After deciding whether you want to do anything with the floors, you can think about the walls too. First, address any repairs you might need to make. For example, you might need to fill in any holes or other damage. Perhaps you want to replaster them, or you might want to remove a rail around the middle. A coat of paint can transform a wall right away, but consider your colors carefully. If you want to sell the property, it’s better to stick with neutral shades, which will make for an easier sell to potential buyers. Kitchens and bathrooms are the rooms that you most need to address. All the others are probably bare rooms that you can do anything with. But you need to think about the fixtures in these two rooms. If they’re run down, they can make the rooms look cheap and out of date. Consider what you need to do, if anything, to refresh them. You won’t necessarily need to replace everything. For example, new doors on kitchen cabinets can help. 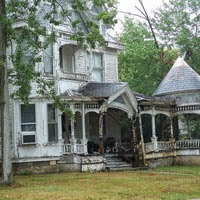 You might have given yourself a large project with the purchase of a fixer-upper. But once you start work, you’ll feel like you’re on your way to finishing already.